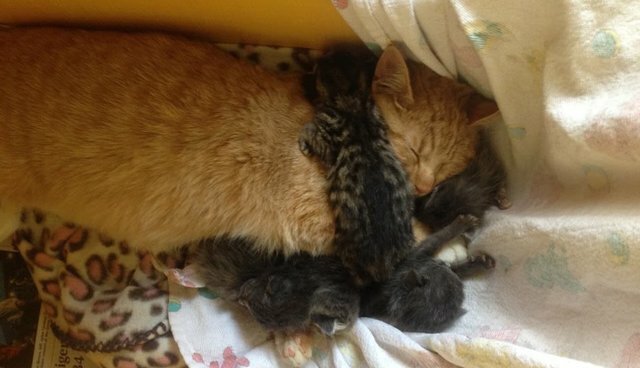 It's not just animal moms who step in to nurture the neediest little critters - a sweet orange tabby has become a loving daddy to six orphaned kittens in an Alaska shelter. When the six tiny kittens were brought to the Ketchikan Humane Society, rescuers weren't sure if they were all going to make it - they were only about a week old, and had been dumped in a box on the side of a road. 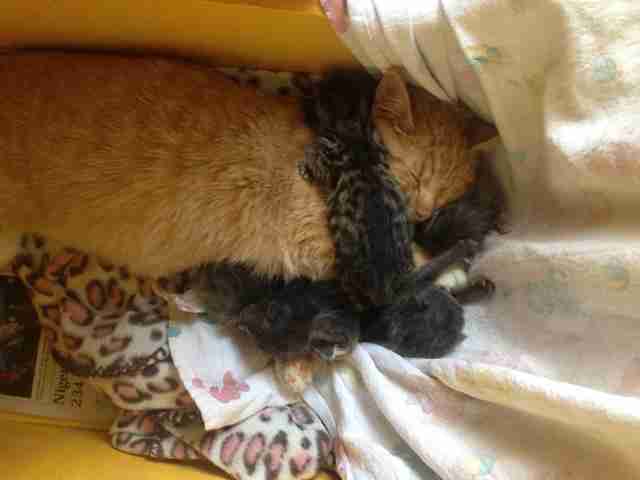 But Henry, a gentle former rescue cat, showed his nurturing side and began to "mother" the little kittens. The Humane Society uploaded a photo of Henry snuggling his new babies last week with the caption "Mama Henry takes his new job seriously. This has to be such a comfort for these tiny babies." Henry is such a devoted new dad that when his kittens went to the veterinarian on Wednesday he "paced and cried all day," and as soon as they came back "he hopped in to give everyone a thorough washing and make sure they were all in good shape." Hopefully by the time the kittens are ready to be adopted into their forever home, Henry will be able to say goodbye to his little brood. Now that Henry has proven what a good mom he is, maybe the shelter will turn to him next time they have some kittens in need of some love.